The time has come to celebrate hitting the big 1K followers, and boy have I got some lovely treats in store for the lucky winners of this giveaway! First off before I get on to the good stuff, I want to say a big soppy thank you to each and every one of you that takes the time out to read what I write, look at my pictures, and leave the sweet comments you all do! I know everyone says this, but it wasn’t for you I wouldn’t still be doing this. Blogging has opened up a whole number of doors for me and I am so, so grateful to all of you! I’m been extremely lucky to have worked with some great people and had some amazing opportunities so far. Blogging has even made me realise what I want to do for a living, so thank you! I know I may not be the most organised blogger, missing posts, not replying to all your comments, but I honestly see them all and really appreciate the time you take out to do so. Big love to all of you! I’ve got two amazing prizes to give away to celebrate, one available to worldwide followers, and one for UK based followers, as I wanted everyone to have a chance at winning something. Some awesome brands have got on board with the first prize which is a collection of fashion and jewellery pieces. This giveaway is open WORLDWIDE! Aztec Triangle Earrings, ‘Polly’ Kettle Necklace, ‘Pray’ Cross Necklace & 2 Alloy Stone Rings – Sitting Pretty. The second prize is open to UK followers only, and will be purchased using my own money. I wanted to give something back myself, so as well as having the amazing prizes that have been donated above, I wanted to contribute to the prize in another way than just some of my jewellery. This prize is either a MAC lipstick or MAC eyeshadow (pan or pot) of your choice! To enter the giveaways, please fill out the relevant Rafflecopter widgets after the cut (click ‘Read More’ at the end of the post!) If you live in the UK you can enter both, but if your name is drawn for both prizes, another winner will be selected for one of the giveaways. All the terms and conditions are stated in the widgets. The competitions will be open for a fortnight and will close on Friday 31st August. Winners will be announced by Monday 3rd September. You must be a follower of this blog via either GFC or Bloglovin’ to enter, as this is a competition to celebrate my lovely followers! If you have any questions please leave a comment or tweet me @c_sittingpretty and I’ll get back to you ASAP! Once more, a huge THANK YOU and big kisses! Good luck everyone! great giveaway lovely! congrats on the followers! Thank you for this! Congrats on your 1000 followers. 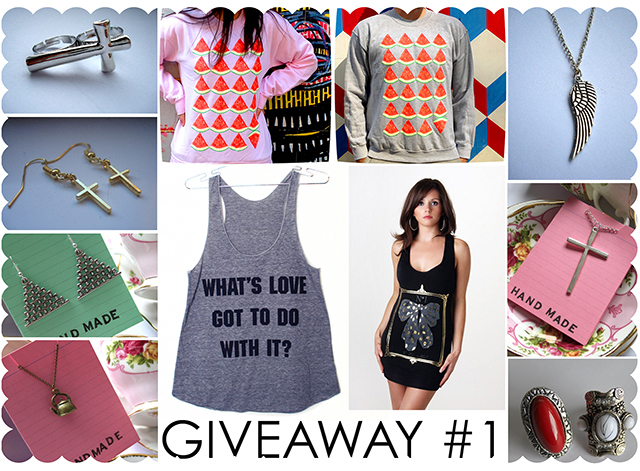 Oh god, this is an amazing giveaway! Thanks for the chance in an amazing giveaway!